Published in Jacksonville, FL. by the Free Press Publishing Company, <1916>. ; Richard Hargrave, Editor. Published in Lake City, FL. by the Index Pub. Co., <1917>. ; J.B. Hodges, President and A.B. Carsile, Editor. The Free Press has the Largest Circulation of any weekly newspaper published in Florida. Leave the original petition without s change or alteration except as in this V amendment stated. Strike out all of the prayer of the t original petition. the 21st of September, 1916, not only in connection with the amended returns made by the County Canvassing Board of Alachua county, Florida, which amended returns from said county have been filed pursuant to a peremptory writ of mandamus of the Circuit Court of Alachua county, but also in connection with each and every other amended and corrected return from each and every other county filed since said date with the secretary of state and with the governor and duly cnvassed as required by law, then and in such event, your relato- will have a majority of votes over that of W. V. Knott which majority will be and remain; that thereupon and thereby that is by said canvass herein sought to be made, it will be shown that the relator was duly nominated as the Democratic candidate for the office of governor of the state of Florida at the primary election held June 6, A. D.1916; that the relator is therefore both in law, in equity, justice and good conscience entitled to have the respondents reassemble and proceed publicly to canvass said returns not only from Alachua county as aforesaid, but also from those returns now on file, or which may be on file at the time of the canvass herein prayed for, from each and every other county of Florida, without which the inaccurate, untrue and incomplete canvass heretofore made will go without correction ahd will leave, as it should not be left, the declaration of a majority in favor of W. V. Knott of 21 votes, which majority and the certificate certifying the same is a result arrived at by a tabulation based upon inaccurate, untrue and incomplete returns which have superseded by true, accurate and lawful returns required to be made pursuant to -writs of mandamus issued y courts of competent jurisdiction; that said canvass upon such tabulation and said certificate so announcing a majority of 21 votes in favor of W. V. Knott is therefore inaccurate, untrue and incomplete and should by this court be cancelled in order that the true result of the Democratic primary in so far as it pertains to the office 'of governor may be known by a correct, true and lawful canvass of the said State Canvassing Board; that such reassembling of said State Canvassing Board is not only essential as a matter of public policy in order that the best public good may be conserved, but also that a right to which your relator is entitled may be secured, and that thereby not only peace may be given -to the public, but also satisfaction to both the litigants and the contending factions; that unless such reassembling of said board be required neither of said important results will have been accomplished, and your relator, without which, will suffer an injury for which he has no otheradequate remedy. thereupon canvass and speedily determine and declare who shall have been duly and legally nominated in accordance with said returns as the Democratic nominee for governor of the state of Florida, or upon failure so to do to show cause to this court on or before 4 o'clock p. m. upon this the 9th day of October, A. D. 1916, or at s.Euwh other early hour as to this court shall seem proper. And your relator would further pray that if it may appear to the court that the respondents should be limited to such returns as may be on file with them at the time of the issuance of the alternative writ, and not to allow them to canvass such as may subsequent to its issuance and before their canvass be filed with the secretary of state and with the governor, then, if such may be the view of the court, your relator prays that the respondents may be so limited in their consideration of the returns. And your relator would further pray that if to this court the relief prayed for may not be granted to the extent and in the manner prayed for then that this court shall issue such process in the premises with such directions and commands as to this court shall seem proper in order that those things and acts consistent with law, right and justice may be had and accomplished, that peace may be given to the public and to the body politic and also satisfaction be offered and guaranteed to both the litigants and the contending factions, and in order that the true and lawful and just result of the primary election of the Democratic party in so far as it pertains to the office of governor may be canvassed and speedily declared by the State Canvassing Board, as and for which your relator has herein earnestly and sincerely prayed. October 9, 1916, 2:30 p. m.
Sworn and subscribed to before me this 9th day of October, A. D. 1916. According to press reports, Mr. Murrow, an employe of the state of Florida under Mr. Knott, testified that he knew that he had made an error of 11 votes in the canvass of Hamilton county. Passing over the suggestion that he had no business whatever in having anything to do with the canvass of the vote, and the possibility that he had a purpose in assisting with it, he thus convicted himself of a- willingness to connive at fraud, the court takes his word and allows such returns as that to be counted for Mr. Knott. Mr. Knott asserts that he does not want any votes on which there is any taint of fraud. Has he discharged Mr. Murrow, or are the people of Florida still paying 'this man?-Ex. - the recognized head of the Democratic the man I voted for went out and filed air with you on this yere parygraph. sume there was some. I want to say mittee and Democrats of Florida, he upon to lend their active support and that I agree with you that the Demo- became an independent, and it is the assistance to the candidacy of Woode cratic party of Florida is in the gray- duty (loud applause)-it is the duty row Wilson for president, W. V. Knott s est kind of danger of capsizing. When of Democrats of Florida to stamp for governor and R..F. Taylor for JusI came to Florida as a boy from the this thing out. (Applause.) Gentle- tice of the Supreme Court, and Hon. hours after the committee had already . ed; his righteous, sincere, earnest voter had sat there and watched them, Now, therefore, be it arraignment of Mr. Knott made a and had taken copies of what they Resolved, by the Democratic Execuvisible and telling effect on the lat- had done, I knew that the Democratic tire Committee of the State of Florter, who stood leaning one elbow on party of Florida had spoken, and its ida, That the action of the Honorable an empty steam radiator, and repeat- will will stand. (Applause.) I still W. V. Knott in instituting and carryedly was seen to wince as Mr. Hodges supported my friend Knott. I still ing to a conclusion the recount contest related his own feelings and steps in was a Knott man, because I die with in the courts for the purpose of judithis campaign with reference to Mr. my friends. The law provided that cially determining the true DemocratKnott and the nominee, SIDNEY J. the canvassing board was the machin- ic nominee for governor was necessary CATTS. The following extract from ery of the Democratic party, and it in order to properly protect and sea verbatim report contains the Hodges met within 20 days after the pri- cure the rights of the individual Demaddress: ***mary; and all Democrats had the ocratic voters of Florida. *right to go into the courts or to go Mark you, "rights of the individual,"
Look out now fer big posters an' small meetin's. The corporationowned dailies will (sartin, uv coarse) tell you about the "vast crowds," but if you are present you will notice there are only the speechers, two or three leetle, questionable, corporashun, ward politicians, a mustang or two, a couple or so uv flop-eared houn's, an' a bunch uv empty sets! Those circus bill-heads will advertise a list uv speekers as long as yer arm. This is done to fool ye out, so Mistu Knott kin get a whack at ye! Ef they didn't add this yere long list uv names, the mustangs an' flog-eared houn's would stay at home, fer they would ruther scratch flees an fite flies than hear Ole Catts abused! Another amusin' thing is their effort to get up a grate excitement about the "activity uv the Republicans" in order to scare the Democratic candydates into "jinin' Mistu Knott," in the hope uv gettin' a few "out to meetin's" so Mistu Knott can unload on 'em. But the Democratic nominees air not nigh so skeert uv the Republikens as they air uv Mistu Knott, an' air likely to be very keerful with whoom they associate in this yere campane. The biggest lie yit circulated is tew the effect thet Mr. Catts voted in Alabama sence he became a citizen uv Florida. (Certainly of course.)' They will circulate other an! more lies as they draw nearer to defeet. Wunder ef they's still a shootin' at 69? THE END (uv this round). Wherefore Bill opened his mouth and spake to his Henchmen, who had been engaged to change the ballots, gentlemen, you surely have been faithful in getting hold of the ballot boxes and doing the work as directed. If Madison county boys had been as careful as you have been, we would never have been caught up with; you have done your level best and made a good steal. But we are caught up with in Madison and I am afraid it will knock me out; Catts was cnnsidered worthy of the certificate in the first count by the State Canvassing Board. But Pete answered and said: Bill, don't you hold th ecertificate now? Bill answered and said: Yea, verily, Pete, I do, but Catts is running as the nominee of the primary of June the 6th, and the voters, I fear, have caught onto what we are doing and my certificate will not profit me, as Webster said, it is not mixed with faith. Pleas said, Bill, that is in the Bible. But Bill answered and said he was not sure who said it. y the campaign committee, to give etive aid and support in the present campaign. Substitoot the name uv SIDNEY J. CATTS fer that uv W. V. Knott, an' we air with you to a man! Mistu W. V. Knott stands before he peepul uv this yere state virtuLily convicted by our Supreme Court )f tryin' to force our state canvassin' board to count fraudulent votes fer him. How on earth a man can claim to be a Democrat an' vote fer Mistu Knott is to us incomprehensibul! The chairman uv the committee, or egineer uv the "organized" steemroller, "balled de jack" an' "backed an' killed "looped de loop," an! also let off steem, an' afforded "Mr. Cushin" an' other parliamentary on-lookers much amusement an' his own friends much embarrassment. The chairman uv the committee announcez the openin' uv headquarters leer, an' a "whirlwind campane" threwout the state fer Mistu Knott. Uv coarse they added Democraitc candidates in an effort to make you believe Mistu Knott is in good company. One uv the most amusin' things is the effort uv the committee to pulitially sandbag Hon. Frank Clark into supporting' Mistu Knott, an' friendly relashuns with a certain ex-governor uv "Wizard Ile Fame," who is. the power behind the throne in an effort to smear Mistu Knott over the peepul fer governor! But we opine thet Mr. Clark has long sense "cut his eye teeth" politically, an' is not likely to be even "slicked" into a trap. The smoothness with which Hon. Fred W. Butler and associates forced sartin factions to support the regular nominee is one uv the interestin' inner secrets. But instid uv getting' the thanks uv the beneficiary, he may probably git cussed! The Free Press is not like any other paper published in America. It occupies a field entirely to itself. Box 1482, Jacksonville, Fla. Entered as second-class matter December 23, 1915, at the Postoffice at Jacksonville, Fla., under the Act of March 3, 1879. HOW DO YOU LIKE THE DEAL? Well, good people, how do you like the new "Tank?" Hodges, of Lake City, is a real "whirlwind" personified! IS YOUR BLOOD RED, OR WHITE? DOES THAT APPLY TO YOUR LIVER? Do you long again to hear "the voice that made Wizard Oil famous? If so, hang on to Hookworm Bill! What was that-Vanderbilt said about "the people?" What? 0 yes! We thought they meant it that way. Mean enough! The papist "organs" and "mouthpieces" and following certainly do hate "Ole Cata" and forever are trying to knife him. Don't forget that, people of Florida. Is there any reason why Florida cannot produce more home-grown Democrats with red blood in sufficiency to back up their demands and convictions? Do let us see! What's the use of going to the polls and voting for the man you want? You can't have him while "Me an' the Spreem Cort" is on the job. His slightest whim shall bat you down! Why didn't you make "Wiz. 0." Jennings run in the open if you wanted him? Be candid, people, and tell us on November 7, at least, that you want ex-Governor Jennings again-if you do, for that is the meaning of Raney's deal! Democracy is 9ne thing-far removed from realization just now in Flor ida. The Democratic machine and Romanized Ring, lubricated by "Wizard Oil," is quite another thing, just now clutching the throats of the people of Florida! Where, oh, where are all those "whirlwinds" that Mistu Knott was going to call to his colors? Where's Bryan? And Fletcher? And Trammell? And Frank Clark? And many others? Don't see them tearing their shirts as yet for Greenville Bill! Come to think of it, why is it that nearly every virile champion of Democracy who stands up for the candidate of the people in Florida, hails from some other state, it would seem-from Georgia, for instance, where the people do rule? There are, of course, many glorious exceptions, but not enough! "For Sale-One ballot box, in perfect working order. It multiplies, subtracts, divides and adds, exactly as Bill desires. Also, a few window shades with fringe thereon, slightly tainted. Complete, outfit, including all "office cheap for cash. Address, Honest K. Not, care CoL Apple Orchard, Dimmy Krat Offis."-Ex. The Supreme Court decided nothing but certain manufactured disputes, pill-rolled by Greenville Bill, to sicken Ole Catts, but which have in turn sickened and disgusted the people of Florida and scared some judges out of a year's growth! And they have decided 'em just as Bill predicted and desired. How funny! What will the people say and do? Why can't all of us use Mistu Knott's arithmetic when we go to pay our bills? If less is more, and a minority can be transposed into a majority, and a deficit can become a surplus, a failure a success, and a lie outweigh the truth, let us all have an equal benefit--"what's sass fer the goose is sass fer the gander," etc. Try it on Bill's pay check "wunct !" Read history. Learn its lessons. Compare the tracks left on the "sands of time" by other men and peoples with the web-footed tracks we are today pressing into the sand dunes of Florida. See the drift? No? Well, look again and wait! The peoples ever win at last against the kings and all despotism-it is merely a question of time. "Don't give up the ship." and me; but the hands which pillaged our public domain of some majority fqr CATTS that he will be declared ELECTED and if of its best lands and gave them away virtually to the railroads, will elected, by the everlasting, HE WILL BE SEATED, TOO! wield the scepter. Do you get that, George and Bill? We refer to one W. S. Jennings, ex-governor of unfortunate What will your political "magic" do now? Florida who seeks through Bolter Knott to become again governor of Florida without taking his hands out of the dough. THE TIMES-UNION POLICY. A &-I A I XT A XTTA VbTd-ATIMP AA A79T i t _ ___*-I __. We commend that earnest appeal of Colonel Hodges to the State Com- news? Or does it, really now! Is there no inspiration in that example of Colonel Hodges? man? Can it fail to bear fruit? ""d-"rN t ry "
What is the matter with Florida? Shall we admit that Georgia has a of "Republicans" weekly? BETTER AMUSEMENTS. your course to one in sympathy with and consideration for the public and people from whose travails you draw your ungrateful susJacksonville, being still the largest center of population, is of all Florida tenance? cities naturally confronted with the larger problem of amusement for the youth. Nor is that problem a small one. The wild spirit of youth is not to be tamed or disciplined by frowns, nor strictures nor encroachments upon the THE SOPHISTRY OF RANEY. for their amusement-not by deciding for them, but staying with them and Keeping bright the memory of better things while pointing out the ways of danger and then praying that some kindly spirit will ever attend them to keep uppermost the better impulses. To do this, when the youth are determined to dance, it is best to see to it that if dance they will and must, the places where they go to dance shall be the best possible to provide. Chicago is struggling strenuously with this problem as well as are other great cities. The opening of the dancing pavilion at South Jacksonville by the South Jacksonville Amusement Company -on last Saturday night displayed a very gratifying example of what we are doing to provide the best amusements for dancing seekers. Mr. Hoyt received a representative of The Free Press and explained in detail his plan for meeting this demand to the best purpose. We understood him to say that he 4Th not expect "society folks" to come, nor did he want them to come-this for the reason that the most select and circumspect society folks are sure to'confine their dancing to their own parlors and clubs as a rule-and the other class of society pleasure seekers-the blaize set who sneak away from the 400 to go shamefacedly to invade the playgrounds of poor bread-winners--would surely be a detriment to the tone of the well conducted public dance hall such as has been opened on the South Side. About 200 couples of very well-appearing youth were enjoying the opening night last Saturday. The music was fine, the floor splendid-the place attractive and the refreshments ample--and, above all, the deportment was of the very best. If there is a man in town whose keen eye and stiff will power would keep it so, Mr. Hoyt is- the man. Mr. Cook, directly in charge for the present, is the right.man in the right place. It was refreshing to see the pleasure apparent everywhere. Mr. Hoyt called attention to the late investments of Mr. Randolph Rose, the man who showed his manhood by quitting the liquor business with a smile of good grace and perhaps with a sigh of relief that he might now enter a higher plane of activities-in the legitimate amusement field. This is the future toward which charitable folk look forward-to the steady uplift" in business and pleasure that will wean humanity from appetites and raise them gradually to better things. It is the best that we can do in the right direction. their factions, both seeking the same thing which only one of them can fairly have at one time; discounting all the prejudices that naturally or unnaturally enter into the minds of men under heat of zealous contention-the rulings of Chairman Raney in that Saturday session of his state "committee' simply cap the climax for an indecent exposure of inconsistency and apparent dishonorable purpose. If a man would not be misjudged or misunderstood, let him at -least have a care to appearances if he thinks himself smart enough to fool the people even for little while! ToqT such palpable partiality for a court'f ltehose pi is sose that he would take what is not graciously his-or go where he is unwelcome; and to flout all sense of justice and fair play in order to favor this menial raper of ballots and manufacturer of spurious evidence for imposition upon the courts, is about as far down in the depths of degradation as any political ringster can go. Don't offer excuses-do not proffer paliation for what Raney did in that chair and said on that floor-we were there-we saw and heard for ourself. So were some others who saw and know. Raney knows. He knows he has not fooled the people, but has disgusted them and embarrassed his friends. He has polluted Democracy, justice, fair play and honesty of thought. He has degraded the Democratic committee and the party machinery. He has outdone Boss Barnes in those contemptible rulings before our eyes and of course we are in "contempt of committee!" THE CHRISTIAN MARTYRS OF PALISTINE. FATHER McLEOD'S EXPOSURES. for a time the populace were duped into servitude and compromise security of The Land of the Free and the Home of the Brave! place one man in this party and another in that-all to suit the of battle! the misdeeds of Rome and popery. It is this: the name of DEMOCRACY? We guess not! ETERNAL VIGILANCE THE PRICE. "behind the cross is the devil." It refers of course to the abuses you and your ring. Your perfidies have released us, yes! But By W. H. L. McLaurin. The one most conspicuous behind that cross-plastered throne we can and will amend the laws so that this political Vandalism that Knott is on the defensive; that he is the POLITICAL Judas, of invisible but not intangible despotism is the Nemesis of good must cease in all parties in Florida. THE bolster of the Democratic party, THE disrupted of its hargovernment and clean administration in Florida. "The voice that And the neonle will ro ri'ht nn to the nnll on Nnvember 7 nv -T-THE tnl n ,n-o rni qT I ..
we have the thing started; let's re- Of The Free Press, published weekly, at Jack2. Keep the REAL issue-The People vs. The Politicians- solve to pull through; let it cost what sonville, Fla., for October 1, 1916. Catts and Knott-except as they reflect the interests they repre- is our man; he will be a good Knight OUNTY OF DUVAL- ds. characterized the RE-COUNT fiasco will abundantly justify our Small spake unto him, saying: Bill, Pubisher. The Free Press Publishing Company, Jacksonville, Fla.
suspicions of the character of men who would make Knott gov- fear no defeat in the Supreme Court. y Editor, Richard Hargrave, Jacksonville, Fla.
menit, to expect, under the administration of Knott. No min Washington county, when no one 'la. rise above his surroundings, unless he be a man of undoubted cour- wner, a The Free Press Publishing Company. would be folly of the greatest kind to expect an administration of tent; I have a lot of keys and I have more of the total amount of stock are: E. B. Casler, Jacksonville, Fla.
fidelity to the PEOPLE. When a man is politically OWNED by not been idle; when the recount comes E. B. Donnell, Jacksonville, Fla.
rich corporations, plutocratic interests, whiskey rings, railroads up my work will show. R.Y.H. Thomas, Jacksonville, Fla. But th ecourt answered and said: J. V. Burke, Jacksonville, Fla.
F. W. Butler, Jacksonville, Fla.
and ROMANISM, it is im possible to SERVE the people's inter- No more mandamuses shall issue. Edward Anderson, Jacksonville, Fla.
est. Knott cannot serve the people's interests. He is tied hard And Bill said: Tom, you have A. w. Dennis. Jacksonville, Fla.
e69 votes in precinct No. 3 in Alachua. mortgages, or other securities are: None. 4. That Catts is an INDEPENDENT and not the NOMINEE. Then Pleas opened his mouth and other securities than as so stated by him. for Bill if Raney would stay-at home; 1ay of October, 1916. 6. That Catts' name will not be on the TICKET, and CAN- the voters of Florida have all of Ra- (Seal) RICHARD HARGRAVE. be circulated in the campaign before us. And these falsehoods here in conference; the thing is out; SOME MORE KNOTT VICTIMS. wilYePEXPLOED.LYOfircolatedndmursetthsewhopropa a s ate-have been the work of fraud, and I Pablo Beach, Fla., Oct. 3, 1916.
success of this great struggle for freedom in Florida. horde of Knott orators may put out. SYMPOSIUM of all the ISSUES before the people. is of the most vital importance. our fight since we are eternally right and bound to win. Let the midnight ballot box raper do the muddy act, the howling. We are waging a sacred war for God, and, our country, and must not descend to the level of the street vernacular. We must also remember that we have to live together after the election with those who are our political enemies, but could be and should be our personal friends, if we but use a bit of moderation before then. We may not see how they can stand against us and may condemn them even justly in our hearts, but we must live together after the battle is over and since we are sure to be on top then, let us be magnanimous towards those we cannot agree with or may not respect, as we would like now. Nothing is to be gained by any other course and it is to be hoped that whatever provocation may be given that the supporters of Mr. Catts will show only a true moderation and forbearance that will redound to the credit of the great cause of freedom and purity in politics, which we are fighting for. that cannot be caught up with, for something has got to be done and done quickly. But Pete said: Bill if you buy these Crackers for fools and sell them for what they are worth you can go into the banking business. We can do a lot of advertising and make a big fuss about standing up to the nominee. But Pleas said: That is what is in our way; Catts is surely the nominee of the primary of June the 6th, and you are the nominee of the court; this impression you cannot counteract; the voters have got that in their heads and there it will stay until November 7th. Greenville is the slogan that I fear has let the Catt out of the sack. Then Pleas answered and said: Bill, you have been going too fast with your mandamuses; see how it turned out in Dade county; you cannot fool with those people; yet us be more particular in the future about the ballot boxes we try to enter; this thing is getting serious with me. You are requested to call at room 32 Baldwin Building, Jacksonville, any time during day or night, Thursday, Friday or Saturday of this week. As so many voters in the state know us, as we are editor of a Masonic journal in this city, which is well circulated throughout the state, we take pleasure in introducing to you the Hon. J. S. Blitch and ex-Mayor Van C. Swearingen of Jacksonville. We know both of these men; they are above reproach; they are men who stand for principle; if they did not have sufficient evidence of fraud in the gubernatorial recount neither of these men would stand for S. J. Catts; they are better men; they will tell you the truth; I have no doubt at all as to the gains for Knott were the results of fraud. would see that all women of doubtful character in hotels, boarding houses and in resident blocks were run out. I made a speech for him to about 14,000 on this promise. I think it was on the morning of June 8th, a short, heavy-built, comparatively young man came to me in the postoffice and said he wanted to see me; took us to a corner and at once took up the gubetnatorial election, and said we are not going to let this thing stand; what we want with you is this: go to the registration offices that you know and get in with them; if it takes money to do so, it will be put in your hands, and we -will furnish keys that will open any ballot box, and for you to make changes in Knott's favor, keeping a strict count of the box, so we can have those boxes recounted and make small gains in each precinct until we get a safe majority over Catts. Y6u can do more for us than any man in the state and you will get whatever you say. I did not know him, but asked him who he was; he said that was all right, if I would agree to do this, come with him. I said I supported Bowden for certain reasons, but Knott and that bunch who propose to steal the honest votes I shall not have anything to do with, and shall do all I am capable of doing to prevent such a low-down, rascally scheme. I have been so near blind with cataracts I could hardly make my way for quite a time. I have been out of the state, having the cataracts removed, and have had one removed, but the light gives me such pain I have to stay in the shade. If I had my sight I should canvass this state and expose this rascally scheme. Fellow citizens, 'it is a Catholic scheme, and George Raney is the man employed by the Catholics to carry out their schemes. But Florida will turn the whole gang down. Say, let's make Catts' election as near unanimous as possible. We just as well kill out this rascality in its infancy and we feel quite sure than every Protestant in the state of Florida to whom this has been explained will vote solidly for Sidney J. Catts, who is surely the Democratic nominee of the primary of June 6th. We believe in standing for God and right, and will not do any man any harm if we know it. Our ancestors had to leave Scotland on account of these Catholics. Let's stand for God and a free country. I was told today by another interest'ed party who had looked into the matter that what little there was had been eaten up in expense. These poor people are now being 'asked to vote for Knott. They, like others, believe that had the comptroller done his duty they would never have lost a cent. ROBERT RANSON. 'Receiver's Report Commercial Bank. Jacksonville, Fla., Feb. 27, 1915. Dania, Fla., Oct. 2, 1916. Last week I called on my old friend, Hon. J. W. Watson, Democratic 'nominee for the house of representatives from Dade county, in Miami. I asked him who will be the next governor of Florida. He answered Catts of course. He is the regular Democratic nominee for governor and will be elected with an overwhelming majority, regardless of any decision the state Supreme Court may render, but on No-iember 7th the highest supreme court, which is the people, will decide that question of governorship and elect Hon. S. J. Catts with one of the greatest majorities of any candidate on the Democratic ticket, but 'one thing was a surprise, not alone to me, but the whole state says Mr. Watson that Mr. Catts, a total stranger, without money and friends, could slip across the state line from Alabama, put himself up for governor and beat some of our best men for the nomination. The state press ignored him, the state executive committee refused to put his name on the ticket and considered him a joke, is somiehting unheard of in this state or any other state in the Union, but, said Mr. Watson, I think Providence had something to do with it. SAY SOME MORE, BRER CATTS! appropriate. It will take just a few more such as the Sun has been afflicting its readers with-to elect Catts by acclamation, and Mr. Catts had ought to furnish them as speedily as possible. Almost any old thing will do since "Catts said it." nees, for the great good they have done. For, as you know, it is good policy to pick out the candidate that the subsidized, trust-owned and controlled papers are supporting, and then work and vote against him, land thousands -are doing that same thing. The people of Florida are growing weary and disgusted with all this gigantic humbugery. In the coming election, November 7, there should and will be the most determined effort to rebuke and defeat this "court gag" rule and "recount" process by which the second choice candidate is trying to defeat the Democratic nominee of the people. Such detestable tactics as'adopted in this "recount contest" is enough to disrupt the Democracy of the "Solid South." Meet every Wednesday evening at 8 o'clock in P. 0. S. of A. hall, Herkimer building. Visiting brothers cordially welcomed. "What prompted you to marry Miss Brown?" FOR SALE-Seven-room two-story frame house, one block from car line. Will sell at a sacrifice. Phone 5629-J, Springfield. TO OUR 20,000 READERS-OUR DIRECTORY OF ADVERTISERS. Automobiles for HireG. B. Mobley, Northwest Corner Laura and Main, phone 104. Automobile TiresDouble Tread Co. One-third price. See them. 911 Hogan, phone 506. Bicycles and RepairingRamis Cycle Co., No. 10 West Ashley, phone 1951. Custom ToilorsAlderman Co. Suits to individual measure. 647 W. Bay, pjhone 1311. Eye Glasses and OpticianJ. H. Keen, Expert Oculist, No. 50 W. Forsyth, phone 4726. Furniture and House FurnishingsNewsom-Kennedy Furniture Co., 429 W. Adams, phone 4428. Hats Renovated and BlockedHavana Hat Co., Old Hats Made New, 145 Broad Street, phone 7533. Pressing and CleaningWin. L. Mallette. All work guaranteed to please. 622 Main, phone 3274. Valet System. Expert Cleaners. 109 W. Adams, phone 2859. PhotographsStar Studio. Individual and Commercial Work. ShoesR. H. Jones & Co., Fine Shoes at a Bargain. 26 Broad St., phone 7016. J. B. Dixon Shoe Co., Classy Footwear, 1114 Main St., phone 4887. Paints and HardwareStinson & McGowan, 141 Broad St., phone 1603. Real EstateJohn D. Bishchoff, No. 10 Baldwin Bldg., phone M-2659. J. V. Burke, Florida Lands, No. 8 Baldwin Bldg., phone 4581. UndertakersBurns & Campbell, 45 W. Church St., phone 1539. Bring this ad with you. All kinds of Photograph and Commercial Work Attended to Promptly. 10 W. Beaver St. Jacksonville, Fla.
- -. ., -,^, ,^, ,^, .^.^. (^.^' '' .^ ................. .
"The New York World employed the services of Louis Sibbold, a trained observer, and sent him into the doubtful states and others to collect material for an authoritative forecast of the prospect for the political campaign. This report has been made, and is the most instructive for the light it gives on the hopes entertained at Democratic national headquarters. No doubt is felt as to the votes of the Southern states. These are given to the Democratic nominee as a matter of course without investigation as to the temper of the people. Many of them (speaking of us) many of them loved McKinley; Roosevelt especially appealed to some, and we all admired Taft (think of that), but they voted the Democratic ticket. This will do while the candidates advocate Democratic pr Inciples, but how much longer-(The Times-Union sounds the note)-how much longer will we vote for Democratic candidates for president? Since the South cannot elect a Democratic president, where shall other reports be obtained? (And then the Sibbold report tells us; then it copies from the Sibbold report. We are taking about what the TimesUnion says. Then it goes ahead.) President Wilson has not hesitated to violate pledges and promises made on the platform on which he stood as a candidate, promises and pledges he accepted as personal and binding in 1912. Will he be more loyal to the Democratic platform of 1916? Confessing in advance his obligations to the Progressive and Socialistic voters, will President Wilson during a second term consider himself a Democratic official? lie has declared that the Democratic party is only the instrument through which he serves the people; or he has declared himself free of all the bonds of Democratic faith and principles." You will recall, Mr. Chairman, and I call the gentleman's attention to it, too, that immediately after the primary election Mr. Catts in a- statement, stacked away back among the patent medicine ads in the TimesUnion, where his statements generally appear in that sheet, said in substance that the majority was small,1 but "I am now the nominee of the party, and if Mr. Knott had been elected by one vote over me he would receive my unqualified and unequivocal support as the nominee of the Democratic party. (Applause.) He made that state, but, Mr. Chairman, before the State Canvassing Board ever made, proceedings were under way, plans were being considered as to the course that Mr. Knott would pursue. He said so in the papers that he was considering the course that he would pursue, and throughout this entire state, why hundreds, yes, thousands of loyal Democrats look upon Sidney J. Catts now as the Democratic nominee, and not Mr. Knott. They look upon him as the nominee of the Supreme Court of this state. Now, Mr. Chairman, I have the tmost respect for the distinguished gentlemen who preside over the Supreme Court of this state. I believe that they are honest men, but, as my friend Hodges says, they are bound by a set of rules. They were handed up some proof there, I presume, that they could not get away from. I presume, personally those gentelemen are all supporters of Mr. Knott in a political way, but I suppose they would divest themselves of that in sitting as judges upon this question, but you know, Mr. Chairman, you Know a fellow can see a lot more in favor of his man than he can in f-avor of the other fellow's man. Possibly that is it. They saw the law their way, and I presume they are honest in their opinion. I give them credit for it, at least, because I don't think that they would stultify themselves by being dishonest ini the high positions that they hold. cratI-f propose tovote _fo rthe-nominees regardless of whether I like them or not. Possibly I'do not agree with some of Judge Taylor's views as exIpressed in some of his opinions, but, .by. gum, he is the nominee, and I am going to stay by him, and I think 5Sidney J. Catts is the nominee, and I am going to do the same thing by him. -the State Democratic Executive Coins mittee of Florida has been called to. r the Supreme Court, whatever it ma3 I- be? and I am going to cast it like tht SDemocrats of Florida want it cast. this meeting was to draw the Democratic party nearer together; that it was in danger. Since hearing the speakers pro and con, I am thoroughly convinced that I had a misunderstanding as to the intention of the meeting. I see here by the vote that was taken that it does not voice the sentiment of the people. I speak from West Florida. I -know the conditions of that country. I see the vote taken here, the committeemen that are present have expressed themselves largely in favor of endorsing Mr. Knott as the Democratic nominee. If this meeting has not the right to name the Democratic nominee, then, as I underst and now, this case is still pending, and won't be decided until 2:30 today, but will that do for the people all over this state? What impression will that make? It won't make, as I see it, an impression that ought to go abroad. We are Democrats. We should be here fighting for one cause as one man. The vote that has been taken shows that there are men here in favor of endorsing Mr. Knott as the nominee, and you can go back into the counties that I know about-I only know from hearsay-in the southern part of the state, but you can take the representation here to represent the people, and that vote will be more than double to the reverse of what has been shown by the vote taken. Now, what are we here 'to do? We are here to harmonize and draw the Democrats of this great state together; but the acts of this committee, gentlemen, speaking comparatively, is to drive the Democratic babes further away from home. You take a man that is not a Democrat, and the present conditions and the present procedures are offering temptation where virtue is weakening. Now, why is it that men of sense, men that claim to represent the state's best interest, represent Democracy? I am a common Cracker from West Florida, and to express myself, I see this thing in this way. Gentlemen, the true sort of Democracy is not represented in this body today. I believe in Democracy, I believe in the nominee, but, gentlemen, we just as well to submit to it and let the people of this great state be' heard. We can't dictate the policies this body cannot do that; neither can the Supreme Court govern a man's vote. They won't stand for it. So Iwhy not act sensibly in a day like this? It behooves us all to stand together as one man. We cannot run. this thing by rule and ruined disposition. The people are wrought up and I say this in all candor, men that are in the position, that have power, if they love Democracy, if they love Democracy, if they love their ,great state, they will show it by their actions and begin now. Let the people be heard. I Mr. Slater Smith (of Clay County): I wish to call this committee's attention once more to the resolution. You have had the pleasure of resoluting in tthe spring, and the people have had the pleasure of sending you back to rescind your resolution, and once again I call your attention to the f act that the people we elect in November will repudiate the action of this comtmittee if you endorse the resolution offered by the gentleman. You can't crucify Democracy or the people of this state on the altar of the Supreme Court of the state, nor on the supiposed authority of a Democratic Executive Committee. i Mr. Duval: May, I ask a question? Who introduced the first resolution this morning? Mr. Hal W. Adams: I did. Mr. J. P. Simmons (of Volusia County): I have the call received from our chairman. This meeting is called for the adopting of such measures as may be proper and necessary in the aid of the election of all nominees of the Democratic party. I wish to say right here, just as long as we continue to introduce resolutions namIng Mr. Knott, or Mr. Catte I expect to vote against them, until we can introduce a-resolution that is directly for the good of the Democratic party, leaving out the names of all individuals. I expect to stand on the same basis that I have been voting on this morning. Another thing I wish to say is this: I don't think our chairman should be allowed to rule a resolution out of order and have the committee to dispose of that resolution in that manner. Any resolution that comes before us this morning should go direct to the comnmittee. I voted against the first resolution that was put up in the sense of the chairman, but not in the. sense of the resolution. I mean I neither voted for nor against the resolution. I voted against the ruling of the chair. If the resolution had come up I don't say how I would have voted. Until we have a resolution before the house, leaving out the names of all individuals, I expect to vote against them this morning. going to find that 75 per cent of the peoplTe at home are going to vote regardless of the state committee (applause), and I can hardly understand why any resolutions from this com-, mittee, except of a general nature,, take care of the Democratic party. ida and that congressional district nominated those two men just like they did Sidney J. Catts, and they are going to vote for them. Now, gentlemen, it is a condition here, not a theory. We are here to harmonize the Democratic party, and steam-roller methods will not accomplish the work. You have the majority in this committee-you have demonstrated that. You can do anything you please; you can fill a trough f ull of good, cool water, but I will be blamed if you can make the horse drink out of it. You can put the brand of Democracy on anything, but that doesn't make it Democratic. Let it go before the people, and let the people settle which of those two men is the choice of the Democracy. That is my opinion. Gentlemen, I want to see harmony prevail; we are going nowhere this way, we are going backwards, really. I am not in favor of any resolutions committing anybody to any particular man's candidate. I say this, as the question stands today, in my judgment, over 75 per cent of the common people of the state of Florida recognize that Mr. Catts is as much en titled to consideration as they have for Mr. Knott-and I have just one thing more to say, if your steam-roller methods prevail, and you go on and tie the people's hands, you will precipitate the thing that goes to land Mr. Allen of Key West as governor of Florida. Forsyth News Co., corner Main and Forsyth. Snyder Drug Co., Main and Duval. The Guardians of 'Liberty meet in P. 0. S. of A. hall, Herkimer building, 136 E. Bay street, first and third Sunday afternoon at 3:30 o'clock of each month. Visiting members are invited to attend all meetings. Contractor and Builder. Bungalows a Specialty. It is hereby ordered that you appear to the Bill of Complaint filed herein against you in the above entitled cause on the 6th day of November, A. D. 1916, and The Free Press is hereby designated as the newspaper in which this order shall be published once a week for eight consecutive weeks. WITNESS my hand and seal of office this 25th day of August, A. D. 1916. It is hereby ordered that you appear to the Bill of Complaint filed herein against you in the above entitled cause on the second day of October, A. D. 1916. and The Free Press is hereby designated as the newspaper in which this order shall be published once a week for eight consecutive weeks. Witness my hand and seal of office this 2nd day of August, A, D. 1916. By A. J. CASSIDEY, Deputy Clerk. COUNTY, FLORIDA. S. Joseph & Bros.
To Evelyn Simmons, defendant, and all persons interested in the above entitled cause. You and each one of you are hereby required and ordered to appear to the above entitled action of attachment on or before the first Monday of October, A. D. 1916. The Free Press is hereby designated as the newspaper in which this order shall be published once a week for two months. Witness my hand as Judge of said Court of Duval County, Florida, this 28th day 0f July, A. D. 1916. It is hereby ordered that you appear to the Bill of Complaint filed herein against you in the above entitled cause on the 2nd day of Oc~tober, A. D. 1916, and The Free Press is hereby designated as the newspaper in which this order shall be published once a week for four consecutive weeks. Witness my hand and seal of office this 21st day of August, A. D. 1916. A JOINT RESOLUTION Proposing an Amendment to-Sections 2, 8 and 4 of Article VII of the Constitution of the State of Florida, Relating to Census and Apportionment. Section 2 of Article VII is hereby amended so as to read as follows: "The Legislatures that shall. convene in the year of 1919 and thereafter shall consist of one member of the Senate from each county in the State, and of one mpmber of the House of Representatives from each county In the State for every ten thousand of population therein, or the major fraction thereof where there may be a major fraction left over after dividing the whole number of population of the county by the number ten thousand; provided, that each county shall have at least one Representative and that no county shall have more than three Representatives in the House of Representatives. The members of the House of Representatives shall be eleted for a term of two years and the members of the Senate shall be elected for a term of four years, except as hereinafter provided. The election for members for each branch shall be at the same time and places. The term of office of Senators elected in 1916 shall expire on the first Monday in April, 1919. The term of office of Senators elected- In 1918 from the following counties, to-wit: Escambia, Gadsden, Jackson, Leon, Madison, Lafayette, Taylor, Columbia, Nassau, Duval, Marion, Sumter, Jefferson, Lee, Monroe, Putnam, Volusia, Hamilton, Alachua, Broward, Liberty, Hernando, Pinellas, Brevard, Pal- Beach and Levy, shall expire on the first Monday In April, 1921; all other Senators to be elected in th eyear 1918 their term& of office shall ',xvir. on the first Monday in April. 1928. All members of the House of Representatives elected at the general election in 1918. their term of office shall expire on the first Monday in April, 1921, and thereafter the term of office of all members of the House of Representatives shall commence on the first Tuesday after the first Monday In April next succeeding the election. At the general- election in 1920 and thereafter, all Senators, to be elected shall be elected for a term of four years, the term to begin on'the first Tuesday after the first Monday in April of the following year, except that when a new county Is created, the Legislature shall at that time fix the length of the term of the first Senator to be elected therefrom at two or four years with the end in view of keeping the number of old Senators in a balance with the number of the ne. 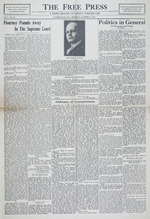 "The regular session of the Legislature that shall meet in 1917 shall apportion the representation in the House of Representatives, as in this Article provided, which apportionment shall be based upon the last census taken by the State of Florida or by the 'United States, which ever is the last taken, in the several counties of the State, and those that shall meet every ten years thereafter shall apportion the representation in the House of Representativs in the manner in this Article provided, which apportionment shall be based upon the last census enumeration taken by the State of Florida, or by the United States, which ever is the last taken next before the Legislature so apportioning the representation shall convene." "When any new county is created by the Legislature it shall be entitled to one Senator and one member of the House of Representatives, until the next enumeration provided for in Section 5, of this Article, that shall be taken after the creation of 'the said new county, or until the next census enumeration that shall be taken by the United States of America after the creation of the said new county, whichever shall the sooner be taken after the creation of said new county, when it shall be entitled to one member of the House of Representatives for every ten thousand of population, or the major fraction thereof the same as other counties." ister, shall present to the registrtion Officer certificate of his naturalization, or a duly authenticated copy thereof. Sec. 2. Upon the adoption of this amendmenat to the Constitution, the Legislature shal enact appropriate laws to carr the purpose of this amendment into effect. and other evidences of indebtedness, of its own and other persons and corporations, for profit; to buy, sell and otherwise deal in lumber, timber, and other building material; to engage in the business of contracting and building; to build, construct and maintain roads, bridges and streets; and to do generally any other act or thing necessary or incident to any of the foregoing classes or kinds of business, for profit. The amount of the capital stock of this corporation shall be Five Thousand ($5,000.00) Dollars, to be divided into five hundred shares of the par value of ten dollars per share All or any part of said capital stock may be paid for in'real or personal property, labor or services, at a Just and fair valuation thereof to be fixed by the Board of Directors. This corporation shall have corporate existence for a period of ninety-nine (99) years. The business of this corporation shall be managed and conducted by a president, secetary, treasurer, and a board of directors comuposed of not less than three nor more than nine stockholders, and such other officers an the Board of Directors may determine; the number of directors elected at each annual meeting of the stockholders shall determine the number of directors of this corporation for the ensuing year. A president, secretary and treasurer shall be elected by the Board of Directors from among their number, at their first meeting after the annual meeting of the stockholders. The names of the officers who shall conduct the business of this corporation until the first annual meeting of stockholders are as follows: Charles M. White, President; L Wiliami Adams, Secretary and Treasurer. The offices of secretary and treasurer may be held by one and the same person when duly elected. The Board of Directors for the ensuing year. and until first annual meeting of the stockholders, shall be Charles M. White, I. William Adams and David M. Gornto. ors shall be elected. The annual meeting of the Board of Directors shall be held on the same date as, the annual stockholders' meeting, at which meeting the said board shall elect all other officers of this corporation. At such meetings, any other matter of business properly coming before the same may be attended to. The By-laws of this corporation shall be adopted, repealed or amended by the Bopcd of Directors from time to time, at any of its meetings regularly held. The highest amount of indebtedness to Which tthis corporation may at any time subject itself shall be Fifty Thousand Dollars. Charles M. White, Jacksonville, Florida, 249 shares. I. William Adams, Jacksonville, Florida, 248 shares. David M. Gornto, Jacksonville. Florida, 2 shares. In witness whereof, the said incorporators and subscribers have hereunto subscribed their names. 1. WILLIAM ADAMS, DAVID M. GORNTO. Before me this day personally came Charles M. White, I. William Adams and David MI. Gornto to me well known and known to be the persons who subscribed the foregoing Articles of Incorporation, and severally acknowledged before me that they executed and subscribed the same for the uses and purposes therein expressed. Notary Public. State of Florida. MY commission expires April 11, 1917. To J. A. Lankford, defendant, and all persons interested in the above entitled cause: L You and each one of you are hereby required and ordered to appear to the above entitled action of attachment on or before 16th day of October, A. D., 1916.
records -of Duval County, Florida. Together with all and singular the tene-ments, hereditaments and appurtenances thereunto belonging or in anywise appertain*ing. The same to be sold to satisfy said decree. ROBERT T. DEWELL, As Special Master. provided by law for general elections in the Whereas, the Legislature of 1915. under the State of Florida. Constitution of 1885, of the State of Florida. In testimony whereof, I have hereunto set did pass three Joint Resolutions proposing my band and affixed the Great Seal of the amendments to the Constitution of the State State of Florida. at Tallahassee, the Capital. of Florida, and the same were agreed to by this the twenty-fifth day of July, A. D. 191L. a vote of three-fifths of all the members (Seal) H. CLAY CRAWFORD. elected to each house; that the votes on said Secretary of Stat..
Now, therefore, L, H. Clay Crawford, Sec- following proposed Articles of Incorporation: retary of State of the State of Florida, do CHARLES M. WHITE. GENERAL ELECTION DAVID M. GORNTO. day next succeeding the first Monday in No- WHITE-ADAMS. for the ratification or rejection of the said purpose have agreed upon and adopted the Joint Resolutions proposing amendments to following Articles of Incorporation: the Constitution of the State of Florida, viz: ARTICLE 1.
agreed to and shall be submitted to the elect- Nature of Business.